I worked on a bunch of things this month as I've settled back into a 5-day rotation on my projects, which seems to be working pretty well. First up was Key to My Heart. Design is from Tempting Tangles, and it's stitched 1/2 on Briar Rose 32-count linen from Hand-Dyed by Stephanie. Floss is Black Current hand-dyed floss from Colour and Cotton. I finished up almost all of page 3 - there's just page 4 and a bit of the motif that splits across those last 2 pages to finish up. Next up, I worked on my Desert Mandala from Chatelaine. 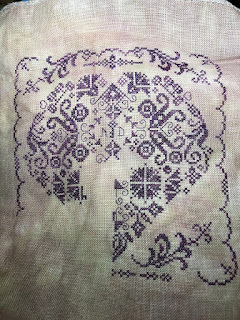 I'm super pleased to report I fixed the burn hole in this upper right-hand corner, and then actually made more progress on the stitching, finishing up the border and the motifs in the upper right-hand corner this go-round. 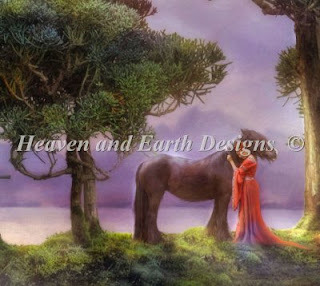 I then had a new start - this is Eternia with artwork by Aimee Stewart and charted by Heaven and Earth Designs. I ordered this as a quick-stitch version, but then decided to crop it down even more, and to also remove the background as I went along. I've started this on a Colour and Cotton hand-dyed 28-count evenweave, which I think will be perfect for the moody gray-blue background. I just got her face finished up as she rests against the horse's neck but I love it! Next I worked on Autumn Fairy by Joan Elliott and got most of her head/hair/head-dress done. 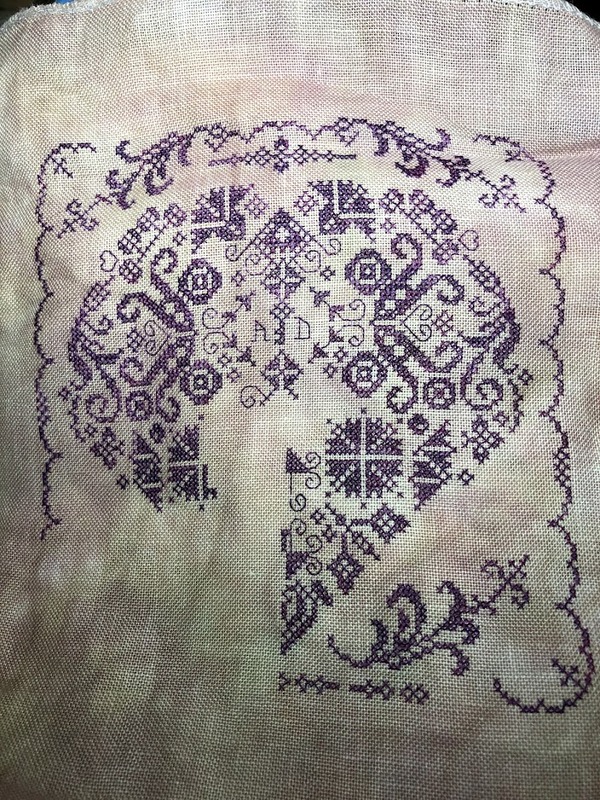 I'm stitching this on a hand-dyed evenweave from Chromatic Alchemy's FOTM club from last year, in the colorway Feronia. Next up was another new start, and another HAED piece - Lady of the Woods with artwork by Steven Roberts. This one will keep me busy through the end of the month but so far I'm really enjoying working on her!